with the other ingredients listed to maximize the HGH release. Years of hospital testing have produced the optimal mixture to maximize HGH release. when combined with the HGH releasing amino acids. Helps to improve overall cognitive and memory functions. It has been known to PREVENT the loss of nerve cells in the brain, and can actually REVERSE the aging of the brain. This is proven to help REGENERATE damaged nerve cells and also helps to improves the overall cognitive and memory functions. A powerful anti-oxidant which is known to help prevent nerve damage. for transmission of certain nerve signals in the brain. carbohydrates. Protects against damage from free radicals. to help lower bad cholesterol levels. Helps maintain a healthy nervous system. Regulates body fluids. production of red and white blood cells. Out of the 191 amino acids in the Growth Hormone chain, scientists have found that specific amino acids stacked in the right ratios and molecular weight stimulates the release of your body’s own natural Growth Hormone. 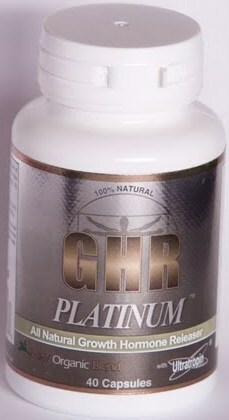 GHR Platinum contains a proprietary blend of these specific stacked amino acids. Known to burn fat, elevates the mood, promote nutrient uptake of the cells, prevent the loss of age related elasticity, reduces physical recovery time and improves physical performance. HGH converts in IGF-1(Insulin Growth Factor) within minutes of the body releasing it into the body. Colostrum is a prime source of IGF-1, which is why usage amongst professional athletes is on the rise. Some researchers believe that colostrum is 3 to 5 more effective than synthetic HGH. A strong HGH secretagogue. Increases lean body muscle gain, stimulates body's healing process and removes toxins. OKG has been used in cancer treatment to reduce abnormal cells. OKG stimulates the secretion and enhances the effects of HGH. This nutrient is shown to slow down the aging of the brain. Improves overall mental cognition, memory and fights depression. Alpha GPC is recommended to stroke victims to help with their cognitive recovery. "Alpha GPC increases levels of the neurotransmitter acetylcholine, which results in an increase in HGH secretion. via gamma-hydroxy-butyrate is a potent stimulator of HGH release. Extracted from the mucuna prurien herb, L-Dopa bean is known to increase HGH production. It's shown to increase sexual libido. It has an anti-diabetic function due to it ability to decrease serum blood glucose levels. We know that certain conditions in the body; including obesity, hypothyroidism and diabetes can cause a drop in GHRH (Growth Hormone Releasing Hormone) from the hypothalmus which leads to decreased HGH secretion. L-Dopa may help reverse that by increasing GHR-H secretion. Supplies physical and mental energy to each of our body's cells. Has been shown to inhibit the aging process on a cellular level, especially among those middle aged or older. Boosts brain fuction. Helps prevent heart diseases. Increases physical performance and exercise endurance. "Co-Enzyme may inhibit the reduction of Growth Hormone levels. Used as an energizer for mental cognition and memory. Increases blood flow to the brain and oxygen to the organs. This increase of circulation to the sexual organs has shown to improve sexual health. Aids in improving memory loss associated with aging and improves mental cognition. Helps liver remove toxic wastes. Within our cells, choline is translated into the neurotransmitter, acetylcholine, which is vital for efficient brain function and communication. An extract of grape seed which is 50 times more effective than Vitamin E and 20 times more effective than Vitamin C as an Anti-Oxidant. This powerful antioxidant helps increase Growth Hormone, enhance sexual libido, improve sleep, burn unwanted fat, known to keep the heart and other vital organs healthy, as well as fight cancer. Goji berries are small, reddish berries that are grown in China. Goji berries have been known to be used by the Chinese to treat a variety of illnesses and health problems for approximately 2,300 years. Goji Berries ease anxiety, facilitate a better night’s sleep, promote a more positive outlook on life and help the body respond better to physical and mental stress. Individuals participating in a clinical study on the benefits of Goji Bberries reported an enhanced sense of well-being and more restful sleep during the 15 day testing period. An ingredient found in the skin of red grapes that is known to have anti aging properties, rich in antioxidants, fights cancer and is a natural anti-inflammatory. Also known for its role is the reduction of heart disease and life extension properties. Benefits highlighted in ABC News special with Barber Walters, "Live to 150, Can We Do It?" Helps increase energy levels. Also aids in digestion. It is essential for transmission of certain nerve signals in the brain. Helps increase energy levels. Used in metabolizing carbohydrates. Protects against damage from free radicals. Helps increase energy levels. Known as an effective weight reducing agent. Also aids in wound healing. Also known to help lower bad cholesterol levels. Vital for normal nerve cell activity, DNA replication and the production of red and white blood cells.